If you're taking some time off work it's a good idea to let your clients know you'll be gone or have your calls forwarded to a different extension. Whether you're going to be out of the office (OOO) for 1 day or an extended period of time, it's good practice to keep as many people in the loop as you can. NOTE: Office managers and call center supervisors must be in "My Account" view to access their Time Frames, Answering Rule, and Messages tabs. 1. Navigate to the Time Frame tab of your SONAR portal. 2. Click the name of the time frame you want to edit or click Add Time Frame on the right side. We recommend using specific dates and ranges for an OOO time frame, that way you only have to set it once and it will automatically time out, whereas always and days of the week and times must be changed manually. Specific dates and ranges will automatically adjust your default time frame around the range you set. If you reopen it and notice there are more "ranges" it's just the systems way ensuring your time frame works with your default the way it was intended. To learn more about how time frames work check out the Time Frames Overview. Once your time frame is ready to go you're ready to set your answering rule. 1. Navigate to the Answering Rules tab of your SONAR portal. 2. Click the name of the answering rule you want to edit or click Add Rule on the right side. 3. Choose the answering rules you want for your time away. The example below displays has Do not disturb enabled, so calls will be sent to voicemail. Notice how if you have do not disturb enabled you cannot also click any of the other options. 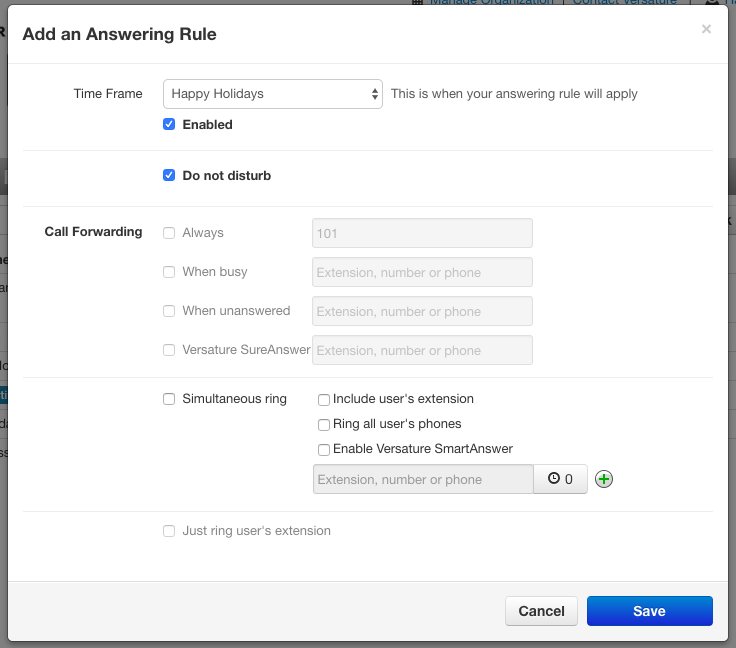 If you want to learn more about how each Answering Rule works, check out the Answering Rules Overview. It's always a good idea to have an out of office voicemail at hand in case you need it. If you know in advance you're going away for a holiday or vacation, you can let people know when you'll be back. Since you are not limited on the number of voicemail greetings you can keep on file, we also recommend a generic OOO greeting for those last minute sick days. 1. Navigate to the Messages tab of your SONAR portal. 2. Click the Settings at the top. 3. 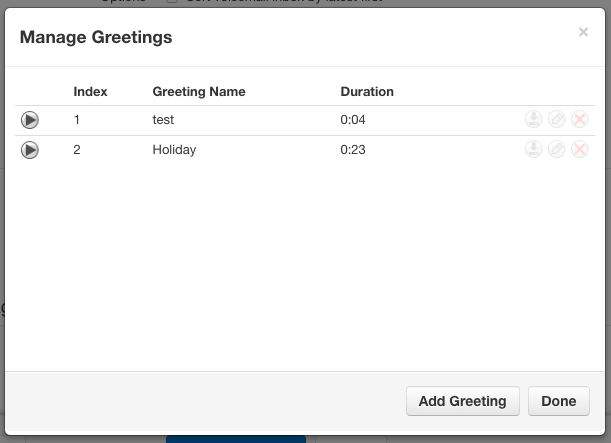 Under "Greetings" click the speaker icon to "Manage" your greetings. 4. In the pop-up window that appears, click Add Greeting at the bottom. 5. Choose either upload or record. Uploads must be in .wav or .mp3 file formats. If you want to record your message on a none Versature device you must enter a 10 digit number with no dashes, spaces, or brackets. Once your upload or recording is properly saved you will be brought back to the previous pop-up window and you will see your new greeting in the list. 7. To change your current voicemail greeting, use the drop-down menu next to "Voicemail Greeting." NOTE: Always remember to save at the bottom of the Messages tab before leaving. Our award-winning customer support team is here for you.